Roughly 2 months ago, I came together with 59 other women founders and growth CEOs to pen a letter called “Choose Possibility”. It was aimed at sharing our perspectives on, and some important new data about, diversity in the tech community. Our data-collection “project” unearthed some eye-opening information about topics like whether a STEM degree is necessary to be a tech entrepreneur (it’s not); how many of the women in our survey had a male mentor (37%); and whether women are judged differently than men in the workplace (86% of respondents agreed). After the letter was published, I was grateful and encouraged to see the support we received on all fronts –in the press, on social media, from fellow entrepreneurs and investors, both male and female. Most of all, there is a strong desire for new, tangible solutions from the community, for the community — to help women leaders contribute at their highest potential in our industry. This morning I’m delighted to announce the next phase of the choosepossibility project, aimed at providing some of those solutions solving diversity issues at the board level. Today, in partnership with 50+ founding members –- both men and women leaders and investors in tech — #choosepossibility is launching a rich and potentially powerful database called the Boardlist. Now in beta, it’s the first-ever, curated resource that helps companies and investors discover and find amazing women leaders for private tech company boards. 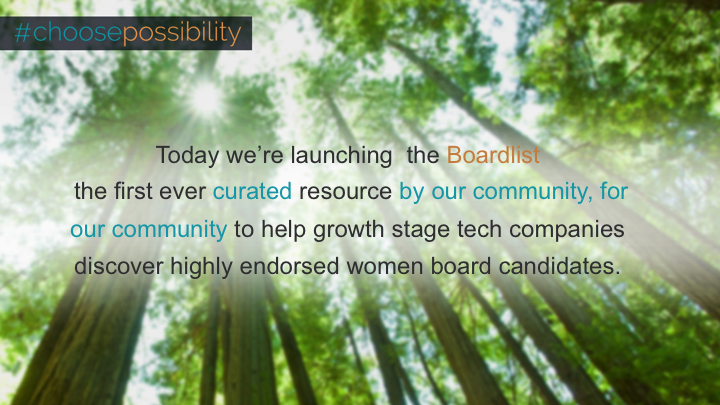 The Boardlist(beta) includes 800+ endorsements of over 600+ women leaders (and counting) who are highly qualified and peer-endorsed as candidates for private growth-stage boards. Our founding members include leaders from Marketo, Lyft, Box, Shyp, Twitter, LinkedIn, Thumbtack, Vida, AOL, Box, OneKingsLane, Accel Partners, Greylock Partners, Battery Ventures, DFJ, Norwest Venture Partners, Harrison Metal, and many others, as well as our founding sponsors WSGR and SVB. We’re grateful for their support as we launch this tool. Long before the letter, I started talking with leading VCs about what could be done to solve the gender diversity problem in tech. I began to realize that, while women in STEM and women founding companies are critical, long-term areas of focus, there is a tremendous opportunity to drive diversity in virtually 100% of privately funded tech companies at the board level, today. We all know, and the data is clear, that every boardroom, founder, and investor can benefit from diverse thinking — — and the earlier the better. We often think of board diversity as being a “public company” problem but I’m not sure why. There are 250 or so public tech companies, yet there are thousands of privately funded growth-stage ones. By our data collection (through the partners on this initiative), we estimate that 23%-32% of private funded tech boards have a woman on the board (including female investor and female founders/CEO board seats). This means that roughly 70–75% of private companies have none. More importantly, at critical stages of a tech company’s growth, the need to have functional expertise, independent thought and insight, and a peer /fellow operator for the Founder/CEO may be infinitely more valuable now than waiting to fill this seat. This is an area we often ignore as private company CEOs but it’s equally an area of massive opportunity. Bringing diverse thought into the boardroom not only drives private company business performance, it has one other potentially large impact: it can also help accelerate opportunities for more gender diversity within the organization itself (from helping to recruit more women to the executive team to identifying policies more friendly to both sexes). The Boardlist is a deceptively simple idea — create a way for leaders in the tech industry to share their top female picks for private company boards so CEOs, executives, and investors can find great women to fill open board seats when they need them. Through the Boardlist, we create opportunities for exceptional women to leverage their talent and expertise while companies benefit from diverse perspectives around the table. Our starting approach was equally simple. Similar to the letter, I reached out to a set of highly credible, diverse leaders in tech -– CEOs, functional leaders, and entrepreneurs alike, and asked them to help. We asked every leader to nominate roughly 10–30 standout women leaders whom they believe to be great candidates for tech boards, according to stage of board (Series B — F, as well as public), functional and industry expertise, and their “superpowers” (what they excel at) to help “seed” the list. The Boardlist(beta) is currently a private, invite-only community tool, but our goal is to grow this resource significantly and thoughtfully in the coming months.